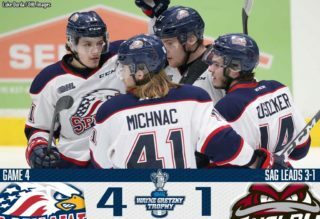 Saginaw, MI – Arizona Coyotes goaltending prospect Ivan Prosvetov nearly pitched his fourth career shutout Friday as the Saginaw Spirit won their 14th consecutive home game, routing the Owen Sound Attack 6-1 at The Dow Event Center. Improving to 22-5-1-1 on the season when possessing home-ice advantage, the Spirit extend their overall winning streak to six games, clinching an OHL Playoff berth for the 13th time dating back to 2005-06. There’s still a three-point difference between Saginaw and West Division leader Sault Ste. Greyhounds. However, if they win their next two games before the Greyhounds play again on Tuesday, it’ll be the first time the Spirit have taken over first place since the month of September. Prosvetov made 34 saves to lower his goals against average (GAA) to 2.98 with a 0.908 save percentage (SAV%) through 41 appearances. The 2018 Import Draft first rounder is now second among league goaltenders in wins at 28. D.J. Busdeker upped his points streak to three games on the first period’s opening goal at 6:03. Delivering from the left circle to the top of the crease, Busdeker scored his second goal this month and first in five games, now sitting ninth on the team in points at 37. The Spirit added their second-of-three goals before intermission off 2017 Florida Panthers first rounder Owen Tippett at 9:27. A turnover near the boards inside Owen Sound’s zone to Brady Gilmour led way to the one-timer in the slot. Six of the nine goals recorded by Tippett in his short time with Saginaw have come in the last three games. That includes Wednesday’s routing of the Flint Firebirds in which the 19-year-old winger earned his fourth career OHL hat trick. Tippett is one-of-five Spirit players to pass the 50-points mark through the halfway point of February. 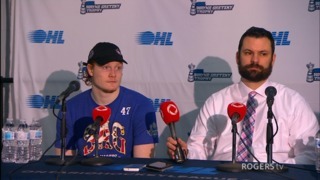 Gilmour, drafted by the Detroit Red Wings in 2017, is one goal shy of tying former standout Patrick McNeill (53) for the most scored in franchise history. Team points leader Cole Coskey took sole possession of 10th all-time among Spirit players in points (155) with 6:53 left. Coskey has notched five points in five games after one-timing a cross-ice backhanded pass from 2018 Edmonton Oilers second-round (40th overall) draft pick Ryan McLeod. Coming over before the trade deadline from Mississauga, McLeod’s assist total stands at 11 in just 17 games with the Spirit, while Coskey needs one more assist to tie Tyler Murovich for 83 in his career. Saginaw would kill a four-minute major in the final five minutes of the first. The man-down unit came into Friday ranked fourth in the league. Andrew MacLean began the second frame by allowing two goals less than two minutes apart from each other. Beating out the Attack defender down the left side was Albert Michnac, who made it 4-0 at 3:14, the overage winger’s 16th goal of the season. MacLean stopped 11 saves before rookie Cole Perfetti reached his fourth multi-point outing in seven games. Capitalizing off a two-on-one break with Gilmour at 5:01, the 2018 OHL Priority Selection first-round (5th overall) pick has finished with at least one point in 13 of the last 14 games, which dates back to January 11. The eight-game points streak is a season-high for Perfetti. It became a six-goal difference with 7:46 remaining in the period once Busdeker produced his first two-point affair since January 19. During those 28 days, the native of Dexter, Michigan, has gone without a point in only three games. Eight of MacLean’s 27 appearances this season have finished with five goals or more allowed. 17-year-old defenseman Igor Chibrikov attained his first goal of the year to end Owen Sound’s scoreless run with 43.7 seconds left to play. Shots on goal favored the Spirit, 41-35. 2018 New York Islanders second-round (41st overall) choice Bode Wilde yielded a plus-minus rating of +4 and one assist. Wilde is tied for second among OHL defensemen in assists this season at 43. 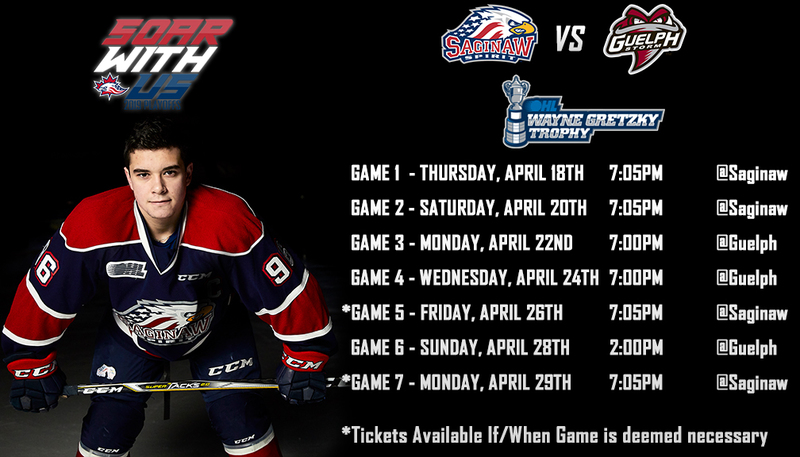 The Spirit wrap up their four-game home stand tomorrow at The Dow when they host the Oshawa Generals. 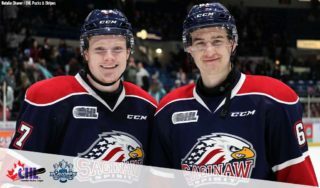 Saturday marks the first of a two-game regular-season series between Saginaw and second-place East Division Generals. The Spirit have won five of the last eight games against Oshawa dating back to the 2013-14 season. Ice Blast Weekend will continue with doors opening at 5:30 p.m. (EST) for a live performance from the “Cool2Duel” Dueling Pianos and chili cook-off.